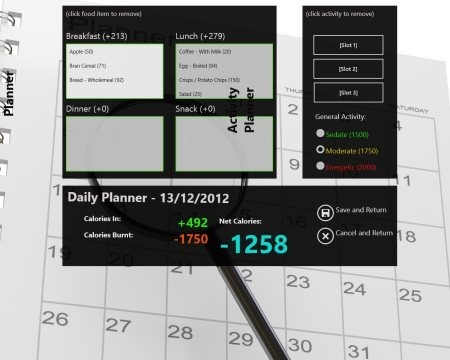 Here are 4 free Windows 8 calorie tracker apps that let you track your calorie intake, on daily basis. This way you can easily lose weight by settings your weight reducing goals and check how much calories you are taking throughout the day. They are the complete food planner for diet conscious people. This calorie tracker Windows 8 app is my most favorite and I am a regular user of it. LiveStrong Calorie Tracker lets you reach your fitness goals, helps you control your diet, thereby loosing or maintaining your weight. The app actually tracks what you eat throughout the day, show how much calorie your body needs, how have you taken till now, and how is still left. LiveStrong tracks carbohydrates percentage, fat percentage, and protein percentage intake throughout the day. Also, you can check the amount of calories you have brunt by exercising or doing other activities. This calorie tracker is very encouraging for health conscious people. Let me quickly point out the main features below. Lets you track calories you intake throughout the day. Personalize your calorie intake according to the needs of your body. If you hit your fitness goal, it gives you a reminder. Progress chart is very easy to read. It’s a free Windows 8 app. Well.. LIVESTRONG.COM Calorie Tracker is an excellent calorie manager that lets you remain fit and healthy throughout the day. Go ahead and download it now..
As the name suggests, Personal Calories Manager lets you manage your calories intake. It comes with five different options: New Calories Intake, View Intakes, Manage Files, View chart, and View Information. You can add food that you have taken throughout the day and see how much calories have you taken in total. This Windows 8 calories app benefits who are overweight / underweight, or are fighting with some health problem. The interesting part is that you can also view your calories intake via graphical plotting. It’s a good utility calories manager Windows 8 app. 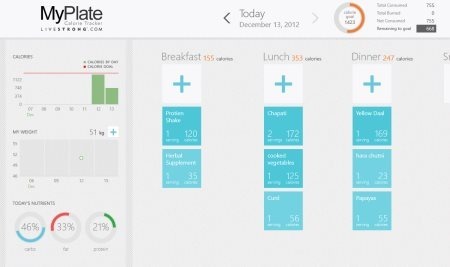 Go ahead and download Personal Calories Manager in Windows 8 now.. Yet another simple yet powerful calories calculator for Windows 8 that lets you track how much calories did you consume and how much did you burn by exercising or doing other physical activities. 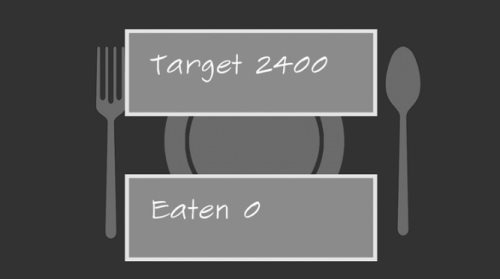 A whole list of food items have been added, you need to select what you ate during Breakfast, Lunch, Dinner, and Snacks you had throughout the day. The ‘Daily Planner’ section will tell you ‘Calories In’, Calories Burnt’, and ‘Net Calories. Let me quickly point out the main features of this Windows 8 calorie tracker app below. Lets you track how much calories you consumed and how much you burnt, throughout the day. ‘Daily Planner’ section tells you the value of calories you take and burn along with ‘Net Calories’ value. Activities, right from swimming, to Volleyball, Rugby, Soccer, Cycling, Gym, etc.. re included for you to add in your calories burnt list. iBurn Lite is a nice beneficial app if you are very much towards healthy lifestyle. It’s a must-have calorie app for diet conscious people. Go ahead and download iBurn Lite now. You need to head over to the app store in order to install iBurn Lite in Windows 8. Also, check out our posts on Oprah Winfrey App, Virtual Makeover App, and Shopping App. Ending my short post with this last but definitely not the least Windows 8 calorie app, Clocal lets you reach your target calories you need to intake throughout the day. This actually makes sure that you are not consuming extra calories or less than how much your body needs. You can see you target calories and how much have you eaten. Also, there is a list of food items from which you can select what all have you eaten. There are many categories of food that includes fast food, drinks, salad, and so on. The good part is that the app brings you the value of how much a particular food contains. It’s a good utility calorie calculator app that helps you remain fit and healthy throughout the day. Now, in order to install Clocal, you need to move over to the App Store and look for the app. Go ahead and download Clocal in Windows 8 now..